An Easter fun day laid on by the All About Netball League proved to be a huge success. Almost 50 girls from Portsmouth, Fareham, Liphook and the surrounding areas descended on Cams Hill School during the holiday period. Surrey Storm star Mikki Austin also dropped in to lend a hand as the young talents showed off their skills in a series of coaching sessions. Organiser Helen Keet admitted the popularity of the event had taken her by surprise. She said: ‘It was a huge shock when places started selling out within two days of advertising. ‘I decided to change things slightly, get a couple more coaches on board and in the end we took over Cams Hill School for the day. ‘Cams have always been very supportive and flexible with me on netball days and this was no exception. It just kept growing. ‘Mikki was a real hit. I first met her when I was running a tournament for England Netball and she was one of the guest coaches. ‘Seeing how the girls engaged with her, I knew our local girls would benefit, too. Austin has tasted Superleague glory twice with Surrey Storm and has also been named fans’ player of the season on two occasions. 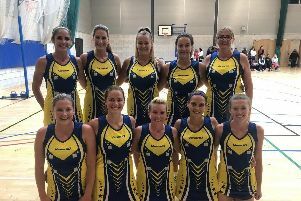 The 24-year-old, who has also been commentating on Sky Sports during a recent spell out through injury, is part of the current Storm squad which also features Fareham’s Yasmin Parsons. The girls were split into age groups – from under-11s rights up to under-16s – before rotating through each coaching session. And after Austin led a group warm-up, they got down to business. Each group had a team leader, with former Cams Hill School pupil Megan Wallace among those keeping the aces on track. Sessions included passing, defending, shooting, movement and changes of pace, while there was also an agility course, crazy catchers test and dress design competition. The winner of the latter was Madi Pickett, while Millie Bradbury was the craziest catcher with a total of 67. After a picnic lunch, during which Keet was able to properly welcome three players who have recently been diagnosed with Type 1 diabetes, skills were put to the test in a mini tournament – with six teams of mixed age and ability. And while competition between the sides was evident, it was the sportsmanship which shone through. Austin then handed out medals to the winners and runners-up as well as two autographed balls. The Storm star chose Alexa Seamer and Charlotte Wallace as her players of the day. Meanwhile, Pickett, Grace Dobbyn and Phoebe Jones were also singled out for special medals. Jones brought along a book for Austin to sign.